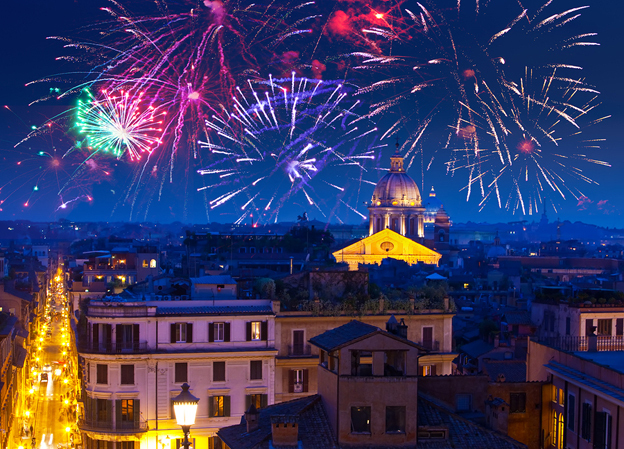 Almost every country and culture celebrates New Year, and Italy is no different, with many Italians continuing to hold on to traditional customs, which promise to bring wealth and banish bad luck. Just after Christmas, shop windows will be awash with red undergarments; both men and women wear red underwear on New Year’s Eve to bring luck in the coming year; red is also the colour of fertility and those hoping to conceive in the following year also wear red. Italian folklore suggests that eating sausage before midnight is a good omen for the New Year; sausage made with pig’s trotters contains a high fat content and this symbolises abundance and, when eaten alongside the lentils, which are believed to bring good luck and prosperity, the diner’s financial forecast for the forthcoming year is predicted to be better than the previous. The dinner is finished off with dried fruit and grapes. It is said to take great willpower to conserve some grapes from the harvest until New Year’s Eve, this indicates that everyone at the table will be wise and frugal with their newfound wealth. To banish previous bad luck, particularly in southern Italy, there’s an attitude of out with the old and in with the new; however, this practice can be rather extreme, as old pots and pans, clothes or any old and unwanted items are thrown from upstairs windows. The act is seen to symbolise letting go of unhappiness in preparation for the future. If you’re out walking on New Year’s Eve in the south, it may be wise to borrow a crash helmet. Similarly, in parts of northern Italy, it’s customary to banish malignant auras by smashing crockery outside the front of your house. Italians love fireworks! The summer night skies are ablaze with them as almost every town and village has dramatic displays at the conclusion of their festa, and New Year’s Eve is no different, so, like almost every other country, the end of one year and beginning of another is celebrated with a riot of bangs and colours.